Staybridge Suites London- Heathrow Bath Road has 145 studio rooms and 45 one-bedroom suites that are all equipped with a fully-fitted kitchen. IHG announced the opening of Staybridge Suites London- Heathrow Bath Road, just minutes away from the international airport. Staybridge Suites London- Heathrow Bath Road has 145 studio rooms and 45 one-bedroom suites that are all equipped with a fully-fitted kitchen, allowing people to enjoy a flexible space to relax, play and work. As with all Staybridge Suites hotels globally, the hotel has a pantry-style food store, called The Pantry, providing guests with everything from snacks and ready-made meals, to toiletries and washing detergent for the complimentary on-site launderette. Staybridge Suites aims to make guests feel comfortable and welcomed while away from home. In line with the brand's hallmarks, the hotel has stylish communal spaces throughout, an on-site 24-hour fitness centre and 'the den' which comes with a games console, giving guests the flexibility to work, host meetings or relax. Every Tuesday – Thursday evening, guests are invited to join an Evening Social hosted by the hotel, to get together with friends or fellow travellers and unwind over complimentary food and drink. Mark Roth, General Manager at Staybridge Suites London- Heathrow Bath Road, commented: "We are excited to be welcoming our first guests to Staybridge Suites London- Heathrow Bath Road. This hotel brings something new to Heathrow and provides guests with the option to stay in the style of room that suits them best. Staybridge Suites is the perfect brand for this location, whether it's for a short stopover stay, a holiday or staying for a longer period of time for business." 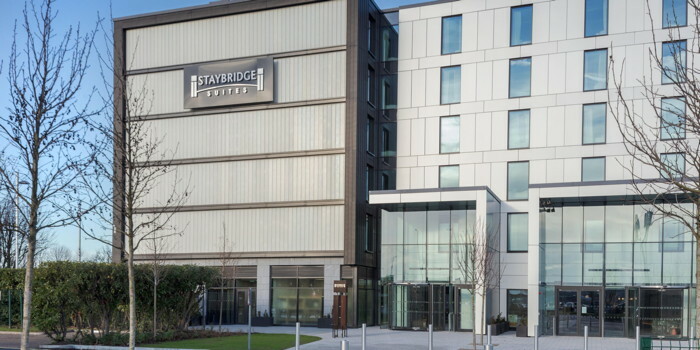 Staybridge Suites London- Heathrow Bath Road is part of a dual- branded property with Holiday Inn, due to open later in 2019. Guests at Staybridge Suites London- Heathrow Bath Road will also be able to benefit from access to all facilities and amenities at the Holiday Inn just next door. Are you with Staybridge Suites? If you are a member of Staybridge Suites you may be interested in learning how to optimize your content on our network.